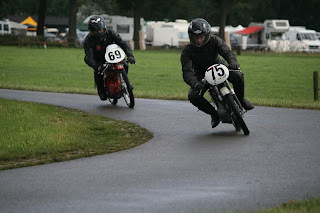 Last saturday I raced my Honda CB50 racer at Enter in Holland. Had some problems with the clutch, just like the week before in Veenendaal, I hope I can get new clutchplates this week for the races in Basse and Purmerend. Otherwise I will have to ride like it is now, not to big of a problem, only when we have a red flag and have to do a restart.